The telecom industry is seeing its revenues from calls and SMS being attacked by over the top players like Facebook and Google. At the same time they are asked to invest in more and faster networks. What the telecom world needs are solutions to reduce costs, reduce complexity, roll-out new solutions faster and most importantly generate new revenues. Lime Micro and Canonical, the company behind Ubuntu, are collaborating to disrupt the wireless telecom equipment field with a low-cost, flexible alternative to standard base stations that focuses on bringing innovative solutions to the telecoms top problems. The SoDeRa is a low-cost software defined radio which through apps can be programmed to support any type of wireless standard, e.g. UMTS, LTE, LoRa, Bluetooth, Zigbee, RFID, Digital Broadcasting, etc. Telecom operators will be able to move between different generations of mobile technology by upgrading software apps without any complexity. They will be able to add additional standards via apps, e.g. LoRa. By making the platform open source, different hardware manufacturers will be able to cost optimise and bring to market base stations at never seen prices. At the same time via app-enabling the base stations new revenues can be generated by the telecom operators. Apps can add new paid services for subscribers, monetization of over-the-top player solutions, cloud integrations, etc. The time to roll-out new solutions will also be dramatically reduced because app development can be done by a large ecosystem of developers with open tools instead of a small group of very expensive experts in proprietary ways. “Traditional telecom equipment suppliers are making mobile base stations as proprietary as possible. This is good for their margins. Telecom operators however need lower costs, more innovation, faster time to market, interoperability, manageability and new revenues. Open Source and App-Enablement are the solution.” says Maarten Ectors, VP of IoT and Next-Generation Networking at Canonical. In the mid-term the SoDeRa will allow developers to come up with new standards that are easy to use and optimised for specific use cases instead of designed by committee to serve most. 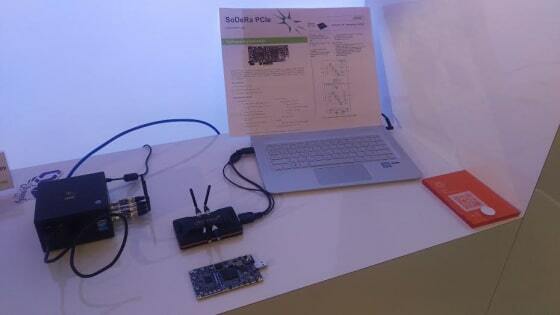 The SoDeRa will be the “Arduino for the telecom and wireless engineer”. You no longer have to be a large corporation to innovate in the wireless communication space. You can see the SoDeRa on the Mobile World Congress booths from Canonical (Ubuntu in Hall 3 3J30) and Lime Micro (in Hall 7 7O36MR). After MWC the SoDeRa will be available for pre-ordering via Indiegogo. To make sure SoDeRa base stations are put into production as soon as possible and operators work as fast as possible towards this, Lime Micro will be working with one operator per country and give them for a limited time frame exclusivity. Starting immediately telecom operators will be able to secure exclusive per-country collaboration with Lime Micro to certify SoDeRa mobile base stations and roll-out substantially cheaper mobile base stations than their competitors. Operators who are interested in this, can contact Lime Micro.